Q How did you get started writing? Whenever I went on an underwater adventure, I was amazed by the beautiful creatures and colourful world they live in. When I met Darryl, looking through his pictures afterwards, it was like living it all over again. We wanted to share these pictures with people and quite by chance we were offered a publishing contract for our first book - Underwater Wonders of New Zealand - published in 1999. Soon we realised that many non-fiction books for children were poorly illustrated. So we turned our attention to write books for children. We started writing about the creatures that lived in the sea, which was very familiar to us. Then moved into other areas, including the New Zealand bush and rocky shore. Q Why do you write books? I like to share stories with children, and especially to share stories and experiences that they might not be able to have themselves. I have been fortunate to see and experience some wonderful things in my life, especially underwater, that many children seem interested in. As long as people want to read what I am wiring about I will keep going. Q What types of books do you write? I write all kinds of books - for adults and for children; picture books and non-fiction books; gift and illustrated books. I write about anything that I am passionate about. For for a long time this has been the sea and the creatures that live there. Many of the books I have written about cover this topic. My first book was a hardback book full of photographs taken in or around the ocean in New Zealand. 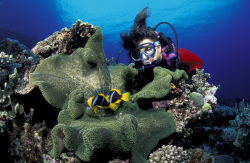 Published in 1999, Underwater Wonders of New Zealand features my husband's photographs. The next book was a children's guide to snorkelling, followed by a guide to trout fishing. A few more children's books followed, and then another adult book, Top New Zealand Dive Sites, took us back underwater for a while in 2007. About the same time, my first picture book, The Stuck There Forever Boat, was released. The next two books were very different - gift books for the US market. Not many words, but lots of pictures. Currently, I am working on a children's novel, and a non-fiction idea for adult readers, whilst waiting for a picture book to be released. It's very different to anything I have done before. Q Who is your favourite author? Q Do you really scuba dive? YES! I learned to dive in the Red Sea when I was 22 years old and still dive when I get the chance, although mostly in New Zealand these days. I have dived in the Arabian Sea, the Red Sea, the Maldives, the South Pacific Ocean (Fiji, Tonga), Papua New Guinea, Australia (Tasmania, NSW, Queensland and The Barrier Reef) and in New Zealand. I like to snorkel as well, and although I like warm water (who doesn't?) I like snorkelling around New Zealand's coastline. When I was a child, we had hundreds of tropical fish in 6 or 7 huge fish tanks. They were so fascinating to watch, which we did as a family most evenings. I also had a pet hamster, pet rats, birds, two dogs, but never any cats - I am allergic to them! As an adult, I have no pets because we used to travel too much to look after them properly. Q What was your scariest moment underwater? To be honest, the one and only time I have been bitten underwater was when a clown fish (think Nemo) bit my index finger. It hurt and bled for quite a while! I have seen lots of sharks underwater but none ever got that close! The time I felt the most vulnerable was when I was floating in the water next to a humpback whale. I felt TINY beside that 45 tonne mammal. Q What are you writing at the moment? I am currently finishing a first draft of a novel for children and waiting for a new picture book to be illustrated which will be released in 2015. And I am exploring some non-fiction options for children and adults. I have two boys, who love to snorkel and can't wait to learn to scuba dive. When they were younger, they were obsessed with dinosaurs, then Lego, then space, and now it's all about science. They spend too much time playing Minecraft and Kerbal Space Program and watching YouTube. Both really enjoy reading as well. We spend lots of time on our boat going to nice places to snorkel and fish. Q Can you come to visit our school? I love visiting schools and meeting young readers. Sometimes I read, show photographs, talk about my experiences underwater, or help children with their own writing and brainstorming. Most of my visits are arranged through either the NZ Book Council Writers in Schools programme, or via Rosemary Tisdall's Getting Kids Into Books programme.